Ilkeston boss Shaun Goater has said his young squad can hold their heads high despite relegation being confirmed on Saturday. The 2-1 defeat to Stourbridge saw the Robins’ fate sealed in what has been a torrid season for the New Manor Ground club. But with such a young squad of players at his disposal, Goater was realistic when it came to analysing what had gone wrong. 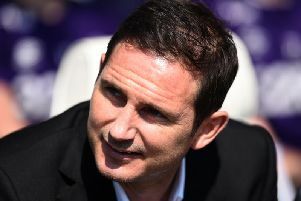 He said: “The squad is too young to successfully compete at this level, we know that, but these players have continued to give it everything in very difficult circumstances and showed that they care for the club and its fans. “Yes, they opted not to travel to Workington but that was out of frustration to do with not having been paid. Since then, they’ve come up against some very good sides and the effort has been there, we just haven’t had the quality to hurt teams. “I was disappointed today because we conceded early on, although I was pleased that we didn’t then conceded a quick second which has been a theme in recent games. “I wanted us to keep it tight and stay in the game, which we did and were rewarded with an equaliser. “They then got their second but we didn’t let them run away with it and it shows we’re improving when we lose by the odd goal instead of two or three. Ilkeston are next in action on Tuesday night when they host Halesowen Town.